Yesterday’s post ended up with quite the discussion on Facebook. I learned something outside my scope of narrow understanding. But the greatest thing about it… It was a civil discussion. Yes! A civil discussion! Something that’s as rare as finding a Mickey Mantle rookie baseball card. Finding an Amazing Spider-Man number 1. Finding a Yugo that still runs. I was waiting all day for things to go screaming off the tracks and crashing into a house of rescue puppies. Because as we all know… People just cannot be civil to each other on social media. If folks disagree they simply cannot let someone be entitled to their opinions, they must get angry and throw civility to the wolves. If a differing opinion arises, it must be tracked down, hunted, and gutted. I experienced that with a friend in real life on Facebook when I wrote about the first time that I walked into the room to see Dr. Ford before the Senate Committee to give her statement about Kavanaugh. Until I read the crawl on the bottom of the TV screen, she looked like Dana Carvey with a Garth wig on. I prefaced the post with all kinds of disclaimers, but that didn’t stop the rage with my particular friend. She said that I attacked her looks, her intelligence, her achievements, and called her names. Which I clearly did not, but in her mind I’m guilty because she believes that I disagreed with Ford’s testimony. Which I did not. She deserved to be heard. But that didn’t keep my former friend from insulting me. Well, she tried to insult me. As a Scorpio, I appreciate good sarcasm even if it’s directed towards my thick radio skin that repels insults like hail stones bouncing off pavement. I’m used to being insulted for entertainment. Nice try though. I responded in kind because I was misunderstood and I just couldn’t let it pass. Don’t poke the bear unless you want the claws. I found it amusing and I found it rather disconcerting. We have known each other for 18 years and I thought that she knew me better than what she misinterpreted. She had no desire to discuss. She was right in her mind and unfriended me… I love the ol’ cheap hit and run tactic… I took a few moments to think about her feelings until it clicked. She rarely “likes” my posts or even comments on them. We’ve only been friends simply because we worked with each other for over 8 years. It didn’t take long for me to realize that it was her problem and no big loss. I don’t need a sorehead friend that gets angry with my stupid observations that they misinterpret. But to get back to yesterday’s post… Ladies, get your mammograms. Everyone is trying to make you aware of the importance of getting them for the whole month of October. And that’s the part that eluded me. The “awareness” isn’t for all of us. It’s for the ones of us that just keep chugging along with the “it’ll never happen to me” mindset. Get those mammograms! And guys, it can happen to you too! 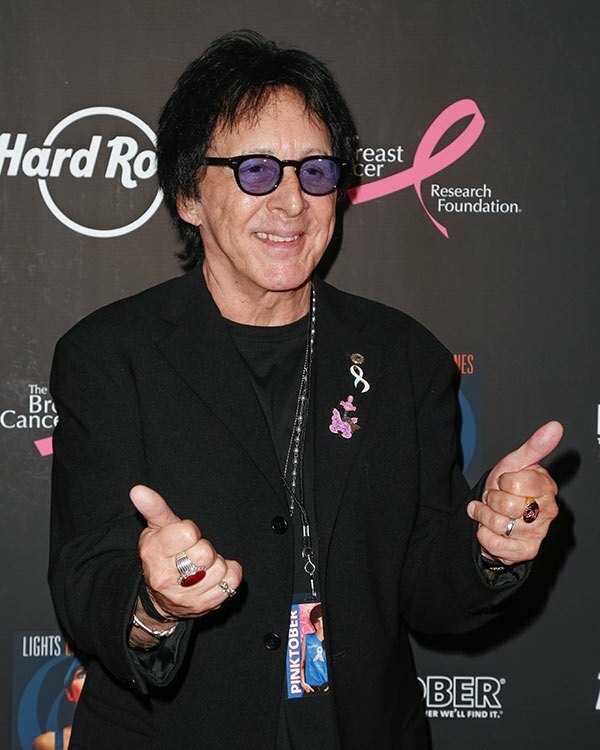 Peter Criss, former member of KISS, is a breast cancer survivor. So, give yourself an examination the same way the ladies do. I do it. There’s a history of breast cancer in my family. And my wife will occasionally supplement my own self-examination with her inspection. If you let your significant other give you an examination, chances are good that you’ll enjoy it. Wink, wink, nudge, nudge.